MORE than 3,600 people have backed a campaign to save a “much-loved” Oxford subway. In July Oxfordshire County Council agreed to spend £45,000 filling in the Headington subway and putting in a pedestrian crossing under a £2.3m traffic scheme. The council said more than half of local people backed the plan. But community leader Mick Haines has vowed to fight to save the underpass, which opened in 1970 and is adorned with murals of local shops and landmarks, like the Headington shark. He hopes the petition will show the council the depth of local feeling to keep it open. Mr Haines, 69, of Croft Road, said: “Ninety-nine per cent of people in Headington and the rest of Oxford want to keep the subway, especially young mothers. 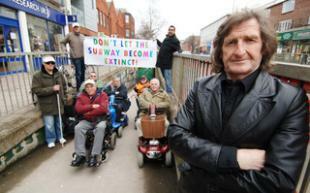 Disabled people will not come to Headington to shop if the subway isn’t there. “People want me to carry on with the fight for it, because it’s part of Headington’s history. Council records show there have been 40 road accidents involving pedestrians crossing London Road over the past five years. But the local authority says a crossing will make the road safer. Pensioner Maureen Green, of Franklin Road, who helped paint The Lion, The Witch and The Wardrobe scene for the underpass, said: “If you take all the character away people won’t come and shop here. If they can spend £45,000 to fill it surely they can spend some of that money to keep it clean and keep it open. Council engineer Colin Baird said it would not be permitted under modern building standards as the ramps were too steep for people with mobility problems. A council spokesman added: “The county council will be happy to receive this petition. “However, as part of the council’s consultation with local people, 58 per cent were in favour of the removal of the subway, which was one of the factors taken into consideration when the decision was made to go-ahead with its removal. That decision remains. Mr Haines will hand his petition to a council meeting on Tuesday, February 9. I READ with interest the article regarding the Headington subway (Oxford Mail, January 25). Well done to Michael Haines for his continued efforts to try to keep the subway. The council says 58 per cent of the local people are in favour of removing the subway. How many people did they actually ask? Michael Haines has a few thousand signatures on a petition to keep the subway. These people all signed voluntarily, I might add, and were not accosted by Michael as has been claimed. The ongoing debate over the slope’s steepness is just an excuse. The reason for doing away with the subway is to make the road wider for a bus lane. My wife and I use the subway as it is the safest way to cross busy London Road. THE county council feedback following the consultation on the future of Headington subway, taken in spring 2009, stated that 58 per cent wanted to get rid of the subway. This consultation consisted of only 419 people out of the whole of the Headington area. In effect, 243 people wanted to get rid of it. This is in direct contrast to the 4,000 signatures I have obtained so far in favour of keeping it. MANY neighbourhoods in Oxford have their champions – Vim Rodrigo in Rose Hill, Sue Holden in Barton, the Bonneys in Wood Farm, Betty Fletcher in Northway, and so on. And right up there with them is the magnificent Michael Haines, of Marston, whose efforts to save the iconic Headington subway have been truly heroic. He’s braved a foul winter to amass nearly 4,000 signatures. Why fill in the subway? Folk should have been given, and should still be given, the option of a subway and a crossing. Michael, a tireless community activist for years, has local Labour members badly rattled on this one. Having capitulated to the Tory county council over the subway, they now seek to denigrate Michael’s efforts to save it. Michael has been accused of accosting subway users, and it was suggested that many of his signatures were those of Students and visitors – the implication being that such people were not bona fide users. Students in Headington? This is hardly surprising given that the area has been virtually annexed by Oxford Brookes. And don’t visitors have the right to cross the road safely? He has been likened to Sisyphus, who was condemned to be eternally pushing a boulder uphill. I think Michael Haines is better compared to Perseus –noble, dogged and courageous. And didn’t he slay a Gorgon? A SECOND World War veteran has added his voice to the campaign to save the threatened Headington subway. Oxfordshire County Council intends to spend £45,000 filling in the subway under London Road and installing a pedestrian crossing as part of a £2.3m traffic scheme. That is despite a petition gathered by campaigner Mick Haines. It contains 4,250 signatures of people who want to keep the 40-year-old subway, which is adorned with murals of local shops and landmarks, like the Headington shark. Now 84-year-old Glyn Hughes, who injured his knee when a ship he was travelling on was torpedoed in the North Sea on D-Day +1 in 1944, has also called for the subway to be saved. Mr Hughes, of Oxford Road, Old Marston, walks with a walking stick. He said: “It should be kept for safety. “I have got problems walking and very often, when I’m halfway across the road, the little crossing lights go out and go green for the traffic. “I frequently get quite a lot of car horns honking as drivers don’t understand that I have trouble walking. “I don’t see the subway in light of its history, because it’s only been there 40 years. But they are talking about spending more than £40,000 to fill it in. Last week, Mr Haines, 69, of Croft Road, received a response from the council’s head of transport Steve Howell, informing him that the authority still intended to fill in the subway when work on the scheme gets under way next month. Accident records show there have been 40 road accidents involving pedestrians crossing London Road over the past five years. The council insists replacing the subway with a pedestrian crossing will make the road safer. The council’s consultation showed that of 243 residents surveyed, 58 per cent of them agreed with the closure of the subway if a new crossing was provided. But Mr Haines, who intends to keep collecting signatures from people opposed to the plan, said: “People say they won’t come shopping in Headington, because they don’t feel safe with a crossing. Council spokesman Marcus Mabberley said: “The replacement high-quality pelican crossing will provide everybody with a safe way of getting over the road, as many people choose not to use the subway currently. THE HEADINGTON subway has kept people safe for 40 years and is a secure way for people to cross the road without accidents. The subway was designed to prevent people being hurt. When we mention to disabled people that the subway is due to be replaced with a light-controlled crossing, they say they would prefer to keep the subway, and would not shop in Headington if it went. One partially-sighted person runs successful business nearby and relies on it daily. A traffic island would not be able to cope with the large numbers of people crossing the road in one go, as the subway can. At Christmas, a party of 150 schoolchildren went safely through the subway. Parents and children love to use it and adults are secure in the knowledge that their children are safe. How can this guaranteed safety be taken away – bearing in mind the heavy traffic and the speed of emergency service vehicles heading down London Road. The majority of local businesses and charity shops have signed my petition to keep the subway open – which totals 4,258. How can any amount of tax payers’ money be justified in filling in the subway at a time of severe cutbacks and recession?